"I saw the snake wrappin' around the cat and it was just squooshin' it"
Here's another good reason to keep your cat indoors. 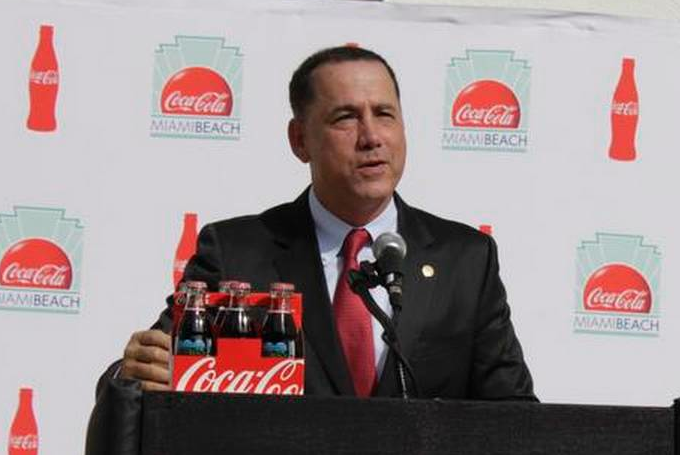 Did Miami Beach Mayor Philip Levine burglarize a Coca Cola truck and steal the keys? 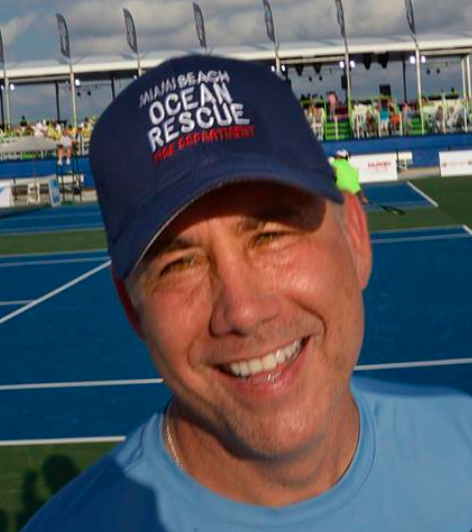 Random Pixels is hearing from sources that Miami Beach Mayor Philip Levine may have committed several crimes last Monday. Levine, apparently channeling his inner Gomer Pyle, is said to have become enraged at the sight of a Coca Cola truck double-parked on Washington Avenue earlier this week. Levine allegedly climbed into the cab of the truck and snatched the keys from the ignition. One source tells me, "The rumor is that there was a Coca Cola truck double-parked and the Mayor went inside the cab, took out the key and refused to give it back to the driver until an officer arrived to issue a citation." On a message board frequented by Miami Beach police officers, someone offered the opinion that Levine may have committed the crime of "burglary to a conveyance." Levine apparently forgot that just a few short months ago, he sang the praises of Coke at a "press conference" as he took delivery of a commemorative, limited-edition six-pack of the sugary poison as a part of the city's 100th birthday celebration. If the details of the alleged Washington Avenue incident are true, it wouldn't be out of character for Levine, an admitted micromanager who's been known to act like douchebag from time to time. On December 6, 2013, Levine, who had been in office less than two weeks, showed up at the Star Island home of millionaire Thomas Kramer for a private party. Unable to get in, Levine soon found himself part of an unruly mob of gate crashers on the street in front of Kramer's home. Police were called and that's when things got ugly. Unable to get in, Levine texted Kramer. Kramer responded by calling police and parking enforcement officers to his home. Cops showed up and talked to Kramer. He told them he wanted the party crashers gone and their vehicles removed. Cops then went back outside and told the crowd to disperse. The unruly mob responded by ignoring the order, and some continued to attempt to get inside. A few in the crowd "physically pushed the officers." At some point, one of the officers, Giordano Cardoso, unholstered his Taser, and after removing the cartridge, aimed it at the ground and fired three short bursts or "warning arcs." According to a just released police department Internal Affairs report on the incident [embedded below], after hearing the Taser, "the crowd began to disperse and obey the officers." [An] investigation of the Dec. 6 incident was instigated by then newly elected Miami Beach Mayor Philip Levine, who told a police supervisor on the scene that officer Giordano Cardoso’s actions were "out of control" when he used his Taser to disperse a crowd trying to get into Kramer’s Star Island home. Though Levine initiated the investigation into Cardoso, the report said he chose not to speak to investigators or give a formal statement. The mayor told the Miami Herald on Tuesday that he spoke with someone at the police department the day after the incident, but did not recall who. The internal affairs report said police made several attempts to talk to the mayor. “Anyone who knows me knows I’m a pothole mayor,” Levine says with a laugh, insisting that he thrives on micromanaging, even down to personally intervening in roadwork. He recalls driving down the Beach’s Alton Road during last December’s Art Basel. A Miami Beach Police Department spokesperson told me this afternoon that he had no knowledge of Monday's alleged incident involving the Mayor. The spokesperson told me he would look into the allegation and asked me to email a request for more information. 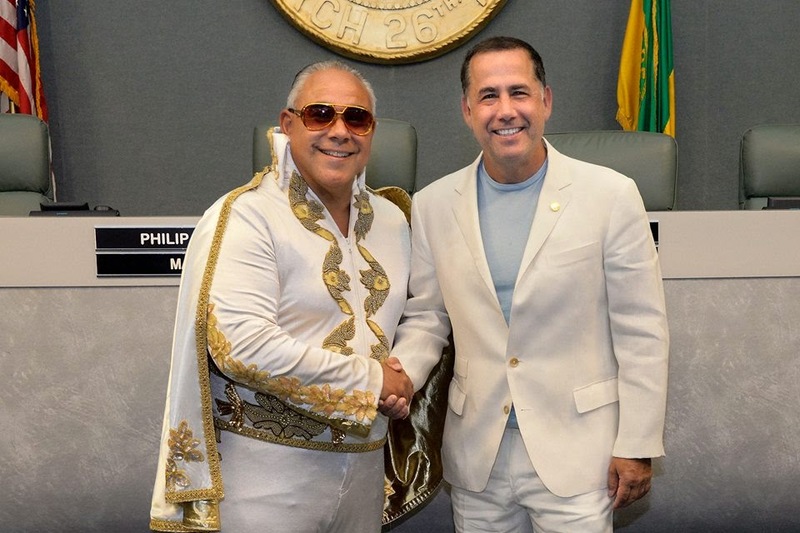 Here's Miami Beach Mayor Philip Levine wearing a guayabera. 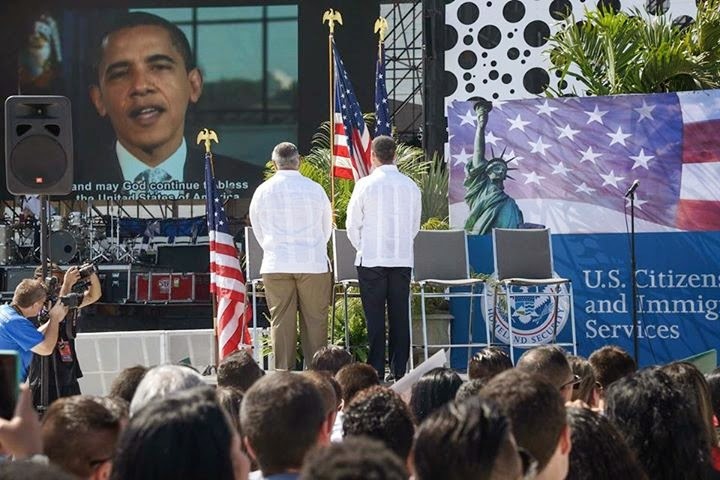 They held one of those mass naturalization ceremonies on the sands of Miami Beach this morning. 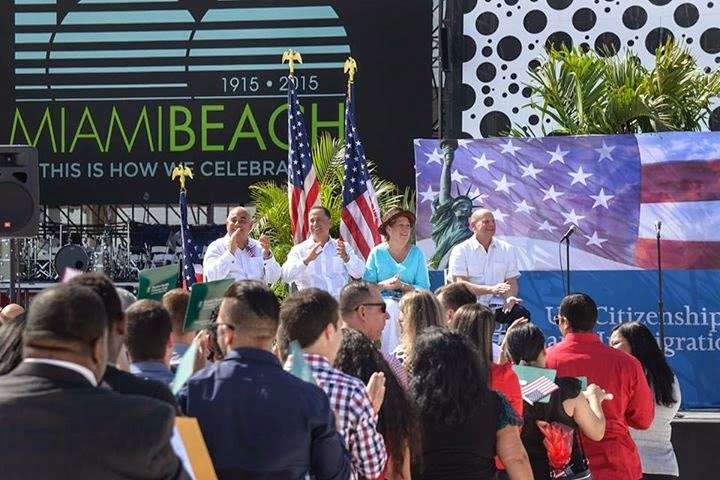 According to the Miami Herald, "100 immigrants from 25 countries ... became U.S. citizens Wednesday morning under the blazing sun at Eighth Street and Ocean Drive, one of the many events staged this week as part of Miami Beach’s centennial celebration." 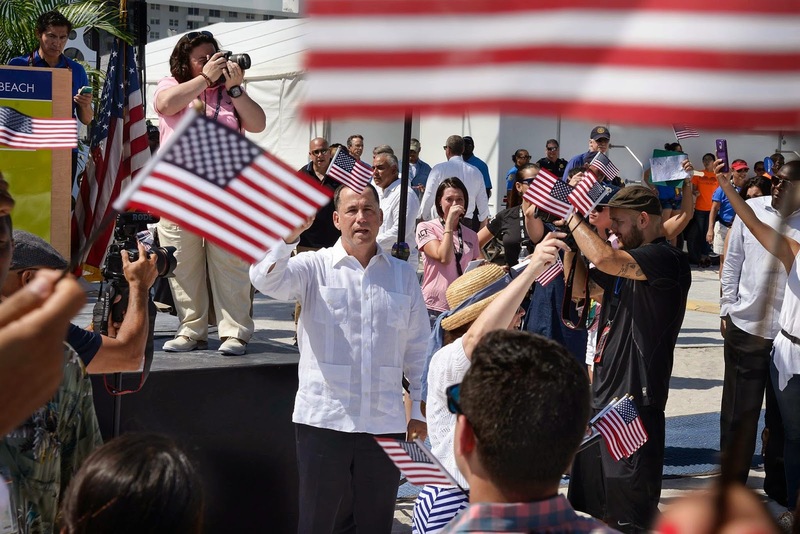 The Herald's 700 word story doesn't mention Miami Beach Mayor Philip Levine because the story wasn't really about Levine...it was about the 100 people who showed up to take the Oath of Allegiance. But I know Levine was there because he posted 8 photos of himself on his Facebook page. The story says many of the new citizens sworn in today are from Spain, Argentina and Cuba. Levine showed up dressed for the occasion in a guayabera....strange wardrobe choice for a man, who, when he was running for the mayor's seat in 2013, disrespected Hispanics by vowing to change the culture in City Hall "from one of being mañana, lazy..."
Levine's sock-puppet City Manager, Jimmy Morales, also wore a guayabera. 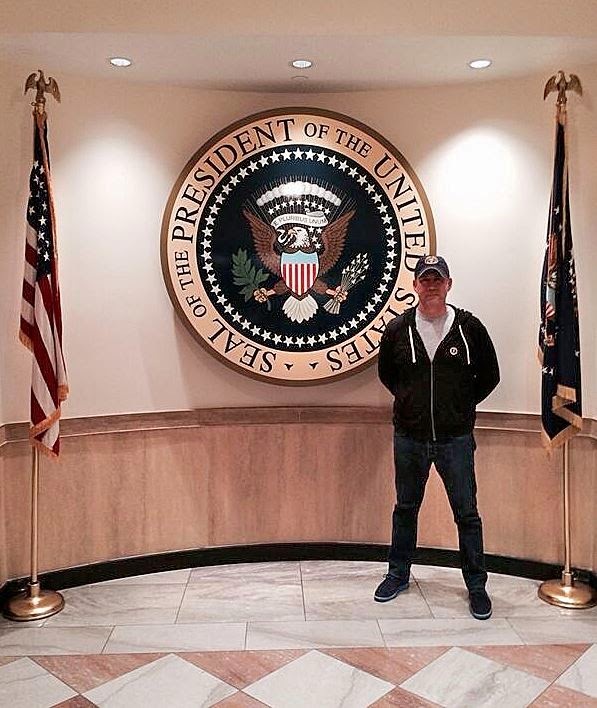 So if 100 new citizens were sworn in today, why do most of the pictures on Levine's Facebook page show him? Because it's all about Philip Levine, isn't it, Phil? It's always about you. Jimmy Morales wearing matching guayaberas, as seen from the rear. Jimmy Morales in their matching guayaberas. 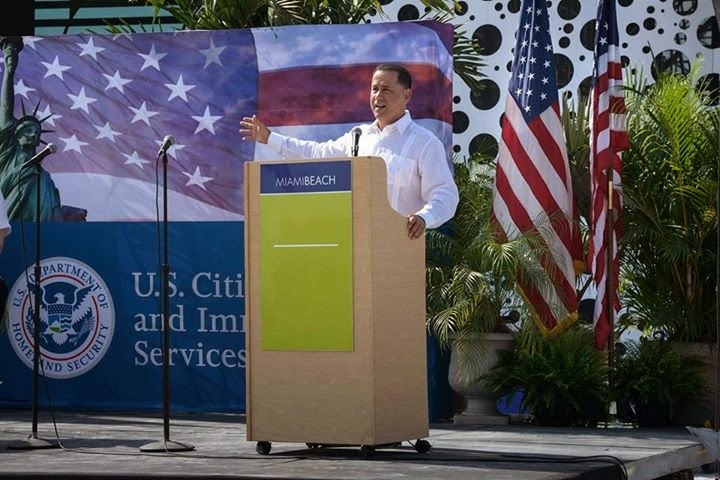 Here are some pictures of Miami Beach Mayor Philip Levine that were taken over the weekend. In one of the photos he's waving and in the other he's pointing. The photos were shot at some event that a year from now no one will remember attending. I've also included a bonus photo of Mayor Levine standing next to a well-endowed lady. Mayor Levine and some lady. Miami Beach is getting ready to kick off a week of events celebrating its 100 years as a city. Miami Beach got its start when founding father Carl Fisher set about to transform a "slender sandspit of mangroves and swamp, mosquitoes and crocodiles, palmetto scrub and sea-stroked beach" into a city. Sometime in the 1920s, Fisher hired a publicity agent for the Beach. His name was Steve Hannagan and it was he who came up with the idea of using photographs of attractive women in skimpy - for the period - bathing attire to promote the city. The idea caught on and the Beach continued to market itself with "cheesecake" photos for the next 50 years. 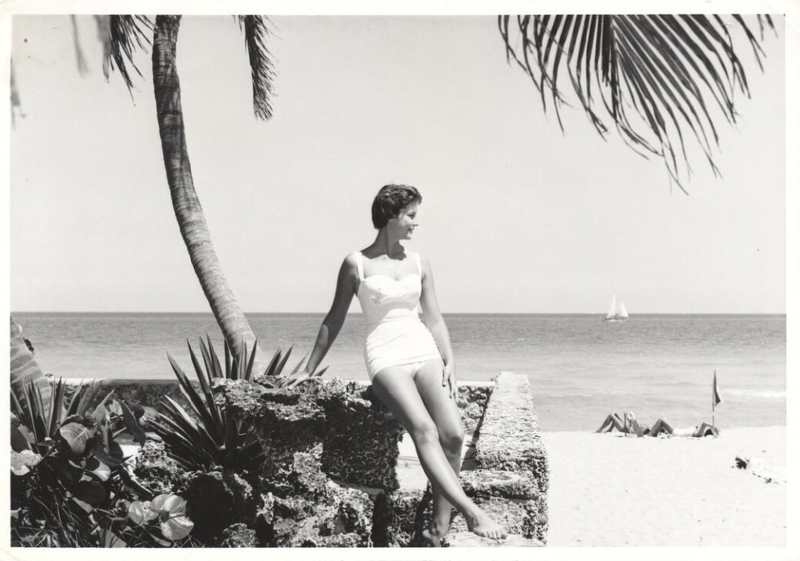 Well into the late 1970s, promotional photographs were taken by staff photographers working for Miami Beach's Tourist Development Authority and sent to northern newspapers by mail and wire services. Models were paid $5 for their time and given a selection of five 8x10 prints for their portfolios. But in the late 1970s, Miami Beach stopped using models to promote the city following protests from feminist groups. Veteran Miami Herald photojournalist Al Diaz scooped everyone in town yesterday when he stopped in downtown Miami to photograph the preps for the Ultra Music Festival 2015 and discovered that former Miami Beach police chief Ray Martinez was working as the head of security for the Festival. Al even managed to snag an EXCLUSIVE interview with the former chief who has been keeping a low profile since retiring from the Miami Beach PD last year. Way to go, Al! If you're a Miami Herald subscriber and you decided to take the day off after looking at today's front page, then you made a wise decision. It's a jungle out there! Former Miami Beach police sergeant Mike Muley was fired last week for drinking while working an off-duty job at Mango's Tropical Cafe on Ocean Drive last July. Muley becomes the latest cop to learn the hard way that cameras are everywhere. MIAMI BEACH, Fla. - Surveillance video released Wednesday by the Miami Beach Police Department shows a former police sergeant drinking while working off-duty at a nightclub last July. Sgt. Mike Muley was fired for his actions last week. According to the paperwork obtained by Local 10 News, Muley had at least six alcoholic drinks (double vodka and cranberry) while in uniform. The video shows Muley with a drink in his hand while being hugged by a woman outside Mango's Tropical Café on Ocean Drive. Another video shows him sipping a drink while sitting in an office. Miami Beach police Chief Daniel Oates said Friday that Muley "terribly embarrassed" the city. 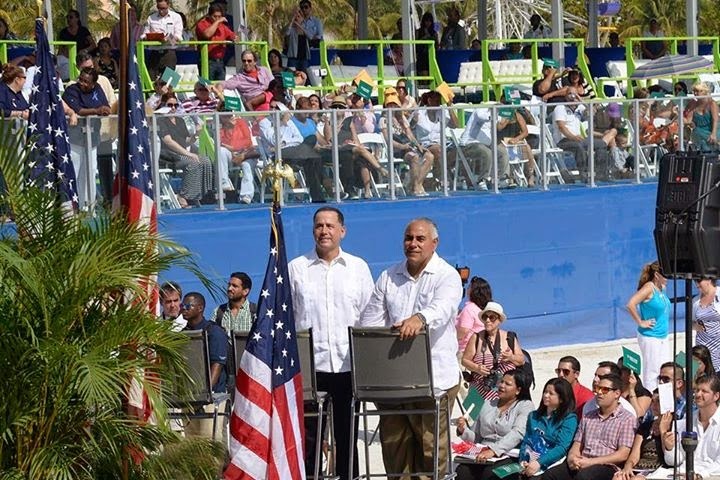 Here's a photo of Miami Beach Mayor Philip Levine trying to look presidential. Today we're introducing a new feature here at Random Pixels. 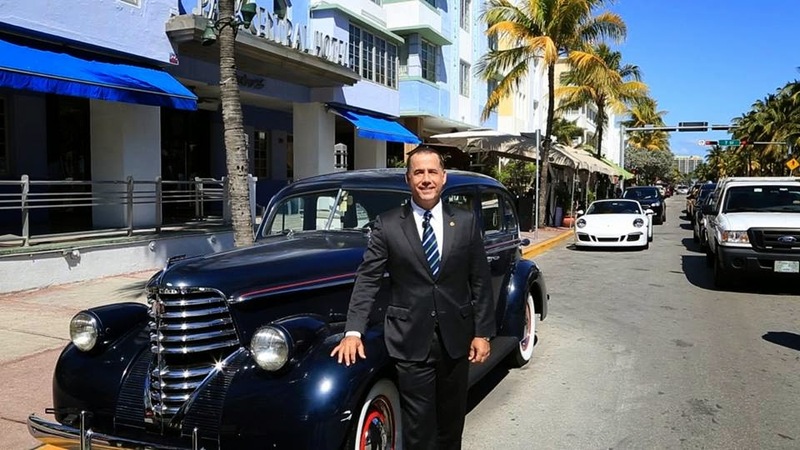 For now I'm going to call it "Here are some photos of Miami Beach Mayor Philip Levine posing with things." Rolls right off the tongue, huh? I started thinking about this after noticing the eerie similarities between Levine's clumsily-staged photo ops and those of a certain Asian dictator. 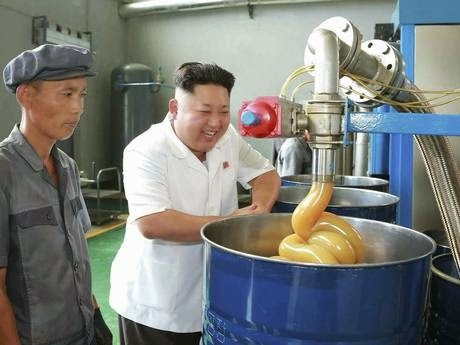 being produced by a goo machine at a North Korean goo factory. So where's the similarity? Both men love having their picture taken. And as far as I can tell, neither one has been told how silly they look in almost all of the photos. Now I kid Mayor Levine a lot. But deep down I love the guy for his honesty. 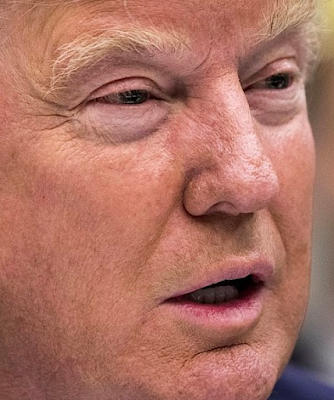 He doesn't pretend to be anything other than what he is: an egotistical, slightly pompous, always obnoxious, self-important megalomanic who's very pleased with himself. Last year he told a magazine, "I wake up every morning and I’m so happy I’m mayor." I'm sure Kim Jong Un wakes up every morning feeling the same way. But what makes Levine's Facebook photos so perversely appealing and charming is that despite all his money and polish, he obviously has no idea how silly he looks in these amateurish attempts to appear as though he's in control and in charge. And don't get me started on his oily smile. It's safe to say that no other South Florida politician churns out silly, useless, meaningless pictures at the rate that Levine does. All politicians pose for pictures. But Levine somehow manages to appear both patronizing and creepy in his photos. But the only thing more inane than the photos themselves are the asinine captions he attaches to them. 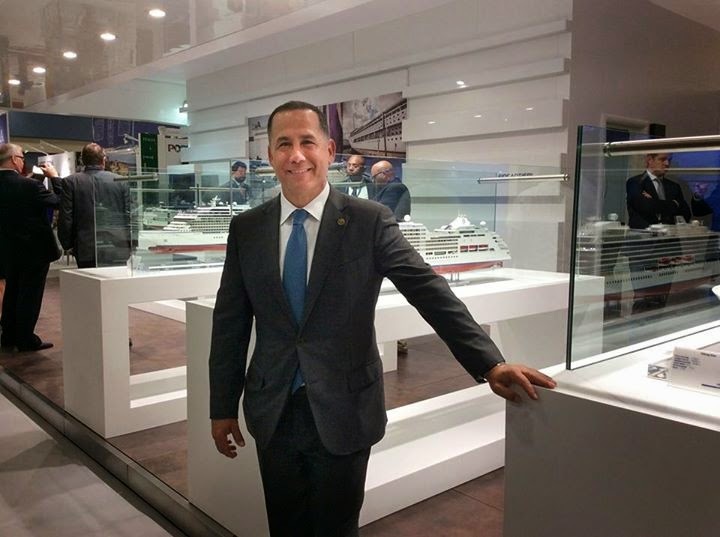 It was great visiting Cruise Shipping Miami. A study finds that newspaper readers are able to distinguish professional photographs from the crap churned out by millions of idiots with camera phones. Have advanced camera phones stunted our abilities to recognize professional photography? In the wake of mass layoffs of photographers from major news organizations like the Chicago Sun Times and Sports Illustrated, the National Press Photographers Association (NPPA) wanted to find out whether or not typical newspaper readers preferred — or could even tell the difference between — photos shot by professional photographers and those contributed by amateur shutterbugs. Not only did viewers know what they liked, but they were able to accurately identify which of the 200 photos and captions they were asked to view were shot by pros, and expressed a distinct preference for the professional over the user contributed images. Millennials think they're entitled to free news. The producers at Miami's Local 10 will do anything for page views and ratings. And that includes insulting the intelligence of the station's viewers by recycling a 20-year-old story and presenting it as though it was breaking news. 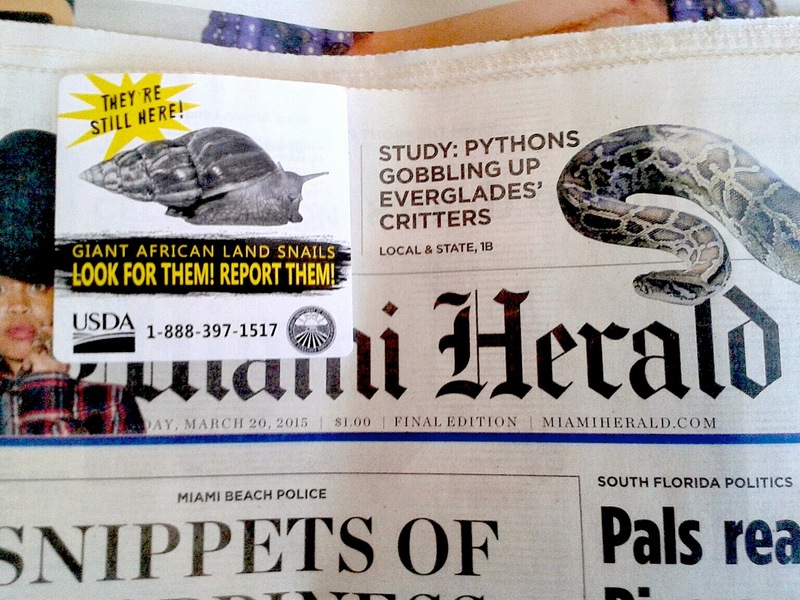 Local 10 story, March 12, 2015: Animal remains routinely found at Miami-Dade County courthouse. 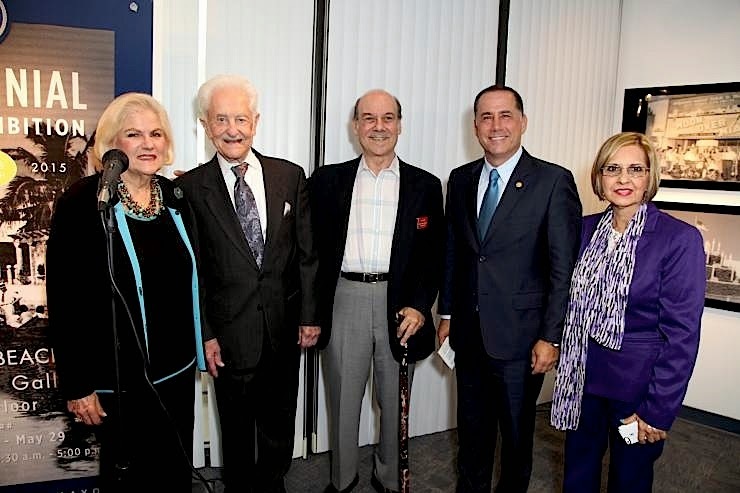 MIAMI - It's become a common occurrence at the Richard E. Gerstein Justice Building. Lawyers and employees on their way to work stumble to upon bags and cardboard boxes filled with dead animals. "I've seen this several times before," attorney Carlos Gonzalez told Local 10 News. "I see chicken parts. I see tongues." Voodoo? Life at the Metro Justice Building is like no other place in the nation. In Miami, some defendants turn to the gods. They toss dead chickens, roosters or goats on the courthouse steps -- hoping the sacrifices will sway Lady Justice to let them go. 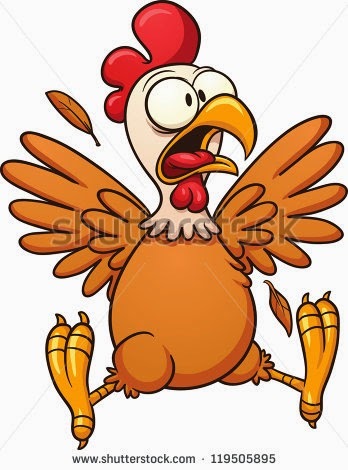 "Sometimes we find one chicken. Sometimes we find three or four," said Raul Guasp, a courthouse maintenance man. "It all depends on who is on trial." If all that isn't depressing enough, consider this: There's a newspaper reporter in Illinois who took a weekend job at McDonald's last year to make ends meet. Mickey D's recently gave him a raise of 10 cents an hour. But at his newspaper job, he and his colleagues haven't had a raise in seven years. Read all about it by clicking here. 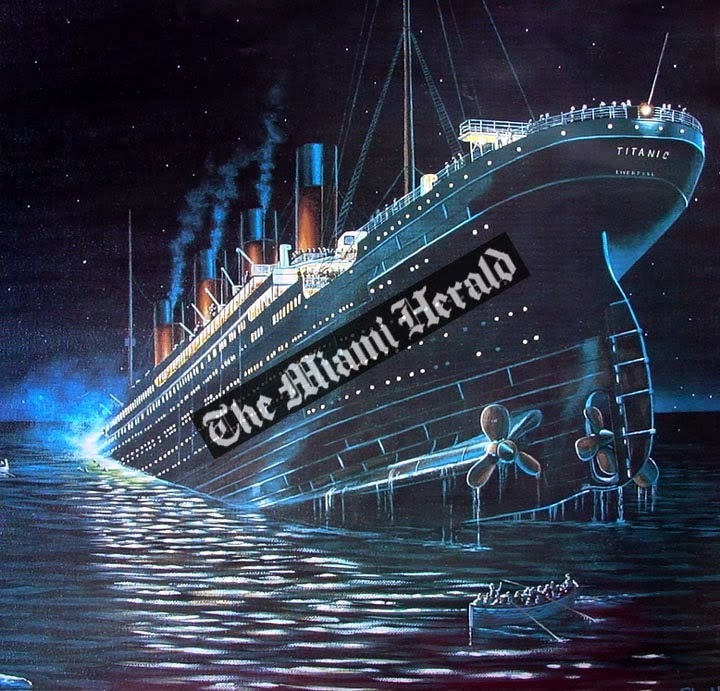 But here's some good news: The Miami Herald has plenty of job openings! 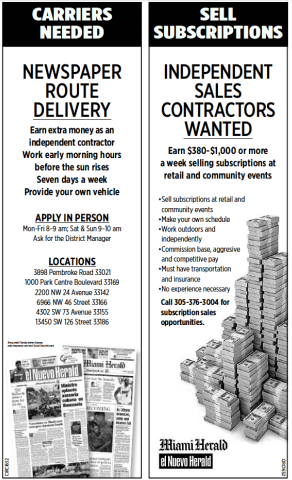 My first thought after seeing the ad for Sales Contractors: I'm pretty sure if you sold Miami Herald subscriptions, non-stop, 7 days a week, day in and day out for 20 years, you'd never make anything close to the pile of money you see in that photo. Just sayin'. 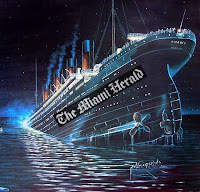 Miami Herald, March 16, 2015. Via Gawker: "For the true experience lies in the chase, does it not? Without it, one grows indolent. Teeth once sharp grow dull. Eventually all rapids empty into still pools. Don't ever stop running, turtle!! Your lot in this life is not to catch the dog, but with this attitude, young man, you'll never truly be far behind." 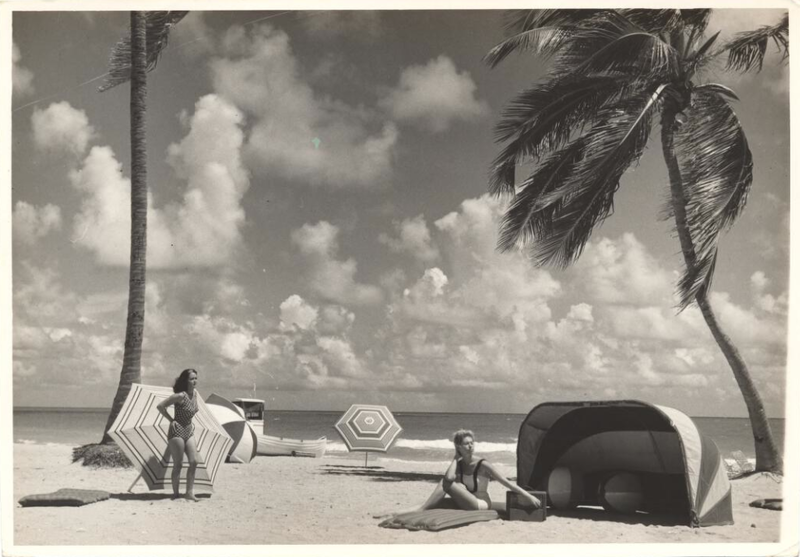 Why does Miami Beach want to celebrate its 100-year history by deleting part of it? celebrating Miami Beach's 100 year history. Perhaps Seth Bramson should have seen this one coming. After all, he's been down this road before. In December 2008, the City of Aventura commissioned Bramson, a self-described South Florida "historian" and author, to write a book on the city's history. According to an October 2013 story in Biscayne Times, after submitting a draft of the book, Bramson was invited to a meeting with Aventura's mayor and city manager where he learned "they had essentially rewritten his book, deleting chapters and pictures, and eviscerating the substance of his work. Never before had leaders of a city profiled in one of Bramson’s books censored its contents. "[The mayor and city manager] conditioned the city’s underwriting commitment to Bramson’s agreement to their changes. Bramson refused, and the city withdrew its commitment." Miami Beach has fired the historian it hired to write a book commemorating this year’s centennial celebration over concerns with the content of the manuscript. City Manager Jimmy Morales fired city historian Seth Bramson on Friday afternoon after he read Bramson’s manuscript and decided it wasn’t what the city wanted for its centennial coffee table book. In his story, Flechas reports that "Morales reviewed [Bramson's] manuscript after the city’s Hispanic Affairs Committee raised concerns following a meeting Tuesday with Bramson. "In an email to the city after the meeting, committee member Alex Fernandez said that Bramson had used the terms 'Hispanic and 'Spanish interchangeably." "The chapter recounted some of the scandal that occurred during that time period, including the arrests of city employees on corruption charges,"Flechas reported. A source who has seen the chapter tells me that Bramson made it sound as though the city was on the brink of disaster in the decade that preceded Mayor Philip Levine's election, and that Levine arrived just in time to save it from decay. But today, in a phone conversation with Random Pixels, Bramson defended his 60,000 word book, saying, "I was hired to write a history of the city. I was not told to leave out the bad parts." Bramson added, "Not one word in the book is libelous or defamatory." Bramson told me he relied on research gleaned from numerous books, magazines and newspapers. And in a phone conversation today with Random Pixels, Hispanic Affairs Committee member Alex Fernandez told me, "My intent was not for the book not to be published. 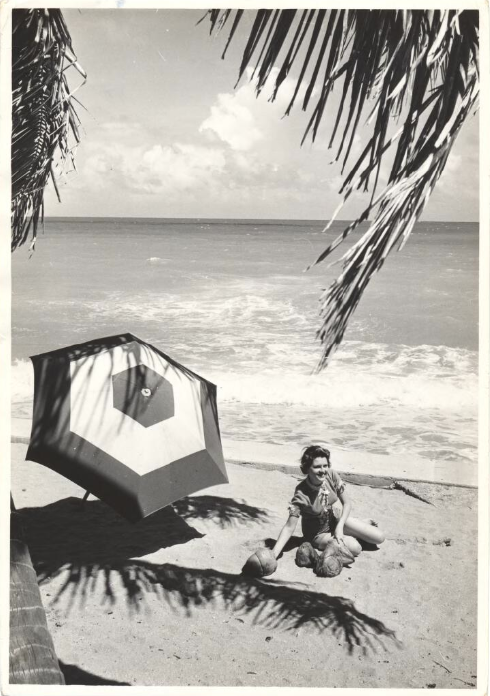 I still think that the City should pursue documenting Miami Beach's history. This was a great idea of the Mayor and Commission. My intent and that of the motion I proffered was to offer constructive recommendations based on what we heard from Prof. Bramson. However, I trust the judgment of the City Manager on this matter." 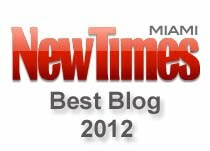 Footnote: MiamiBeach100.com, the city's official centennial website, still contains a section with articles written by Bramson...including one article where Bramson uses material taken - without attribution - from an article I wrote for MiamiBeach411.com in September 2010. Miami News, March 6, 1987. Miami News, March 10, 1987. 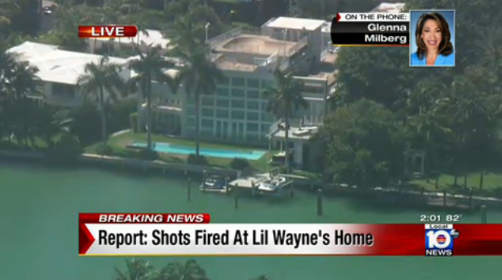 Shots fired at Lil Wayne's Miami Beach home!!!! Every TV station in town spent a good part of Wednesday afternoon reporting that Miami Beach police had responded to reports of a shooting at the gazillion-dollar La Gorce Island home/theme park of rapper Lil Wayne. Police said that someone called their non-emergency number and reported that four people had been shot at the home located at 94 La Gorce Circle. It wasn't long before hordes of local TV reporters descended upon the place and immediately went into full CNN mode....which means they took two or three or shreds of information and repeated it over and over and over again. 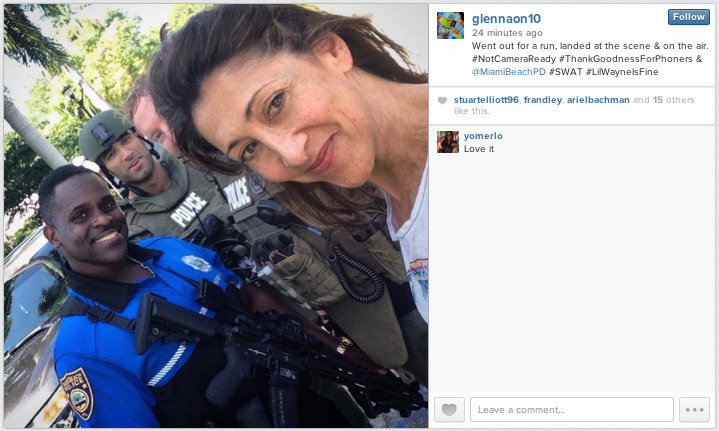 Local 10's Glenna Milberg, who lives nearby and who was off today showed up to beef up Local 10's reporting team. Glenna reported by cell phone that she was out for a run dressed in "spandex and a t-shirt" which enabled her able to blend in with the crowd and look like a civilian because she wasn't carrying a camera....and so the cops left her alone. MORE BREAKING NEWS!!!!!! 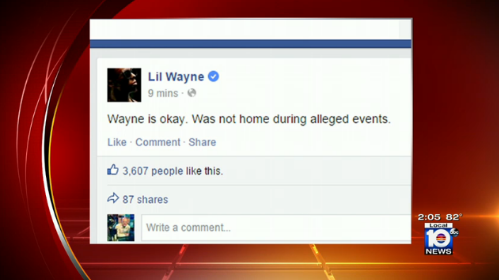 One of Glenna's colleagues emailed her pics of Lil Wayne and the man police were talking to IS NOT LIL WAYNE! REPEAT, he is NOT Lil Wayne! BULLETIN!!!!!!! 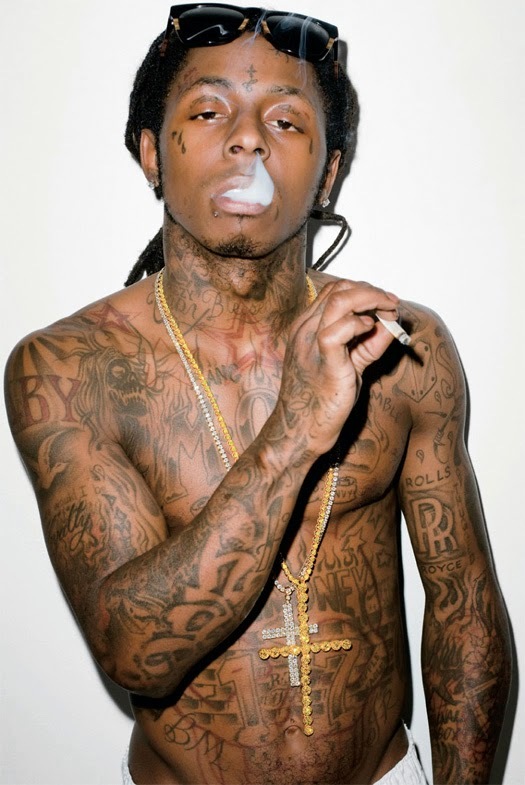 This is Lil Wayne. MORE BREAKING NEWS!!!!! "He's not inside based on social media," Local 10's Todd Tongen authoritatively reported at one point. At 2:51 p.m. Tongen reported "We've been at this for an hour and a half. A minute later, WSVN's Rosh Lowe reported that a source told him that SWAT found no victims inside the house. Lowe added the "whole thing was one large, expensive hoax." Meanwhile, up in the Florida panhandle, 11 service members are missing and presumed dead after "two UH-60 aircraft assigned to the Army National Guard, Hammond, La., were participating in a training exercise over night March 10. One aircraft with four aircrew and seven Marines assigned to Camp LaJeune, N.C, was involved in an accident near Eglin range site A-17, east of the Navarre Bridge." But I'm pretty sure none of Miami's local TV stations will be spending anywhere close to an hour and a half covering the crash on tonight's evening news programs. They finally finished tearing down the old Miami Herald building last week. One Herald Plaza is now just a memory. Now that the building is gone, those in charge at the Herald are now on a mission to destroy what's left of the paper and its last bit of credibility. 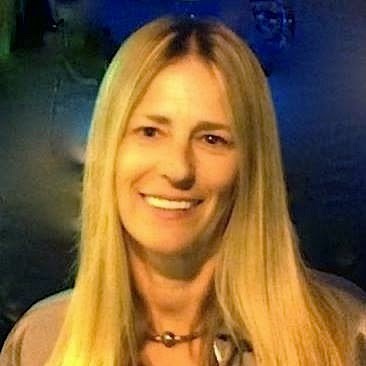 Last December, Cammy Clark, the Herald's long-time Key West bureau chief, lost her job after her position was eliminated. For Keys coverage, the Herald now relies on dispatches from the weekly Florida Keys Reporter, and twice-weekly Keynoter. Today's paper printed one of those dispatches: a story on Spring Break in Key West by KeysInfoNet's Larry Kahn. It ran on 3B of the Herald's local section. The story that appeared in the Herald is essentially the same as what's on KeysInfoNet's website. What caught my attention, however, was the photograph that accompanied the story. Here's the photo that appeared on KeysInfoNet.com. 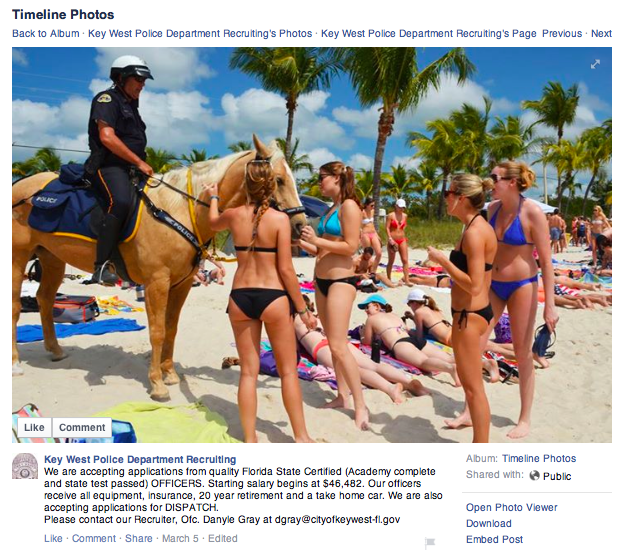 The caption reads: "What appear to be Spring Breakers at Smathers Beach in Key West say hey to a police horse. COURTESY ALYSON CREAN"
Apparently Alyson Crean never bothered to ask the ladies if they were, in fact, Spring breakers. So, who is Alyson Crean? Is she a journalist? Turns out she's a "public information officer; communications manager" for the City of Key West. And according to her Linkedin profile, before she worked for the city, Crean was the Key West Keynoter's bureau chief. By the time Alyson Crean's photo made it into the pages of the Herald, the bikini-clad ladies who appeared "to be Spring Breakers," were now identified as "Spring breakers." Miami Herald, March 9, 2015, page 3B. But here's where things start to get weird. So, how did a picture shot by a Key West city employee end up being used by a Florida newspaper that once employed more than 30 full-time photographers? Simple: it was free and didn't cost the paper a dime. Crean's photo was first posted on the Key West Police Department's Facebook page, before making its way on to KeysInfoNet's website and then into the pages of the Miami Herald. All this has me imagining the conversations that may have taken place in the Herald's executive offices last year as they talked about eliminating the Key West bureau: "Can we do this without sacrificing the quality of our reporting?" "Oh, sure we can," someone probably answered, "but if not, who's going to notice?" 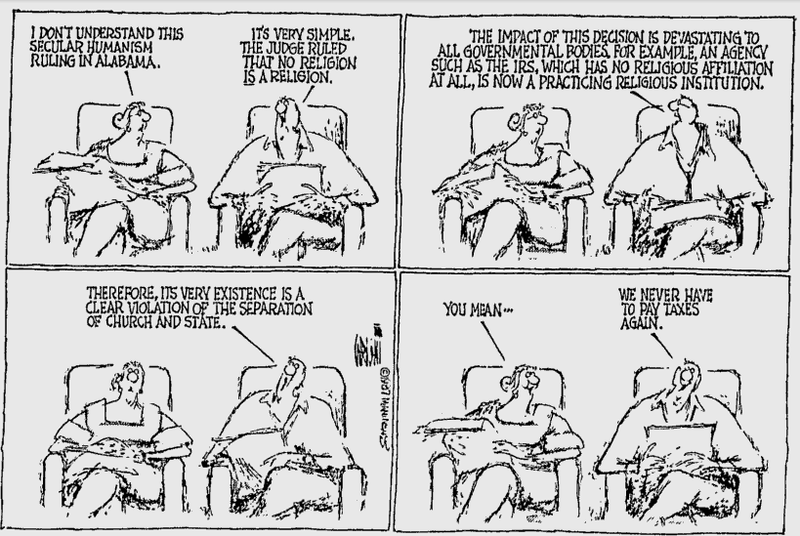 On March 8, 1985, the Miami News reported the Reagan administration was planning to "seek the repeal of the 1966 Cuban Adjustment Act of 1966." 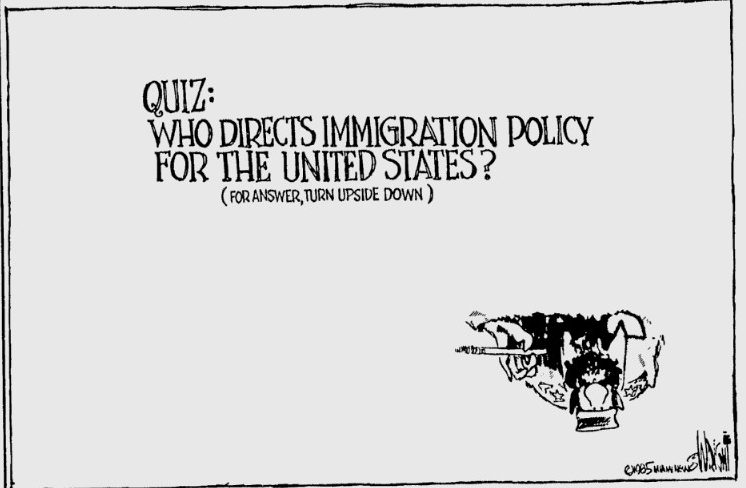 The following day, News cartoonist Don Wright revealed who was really in charge of the U.S.'s immigration policy. 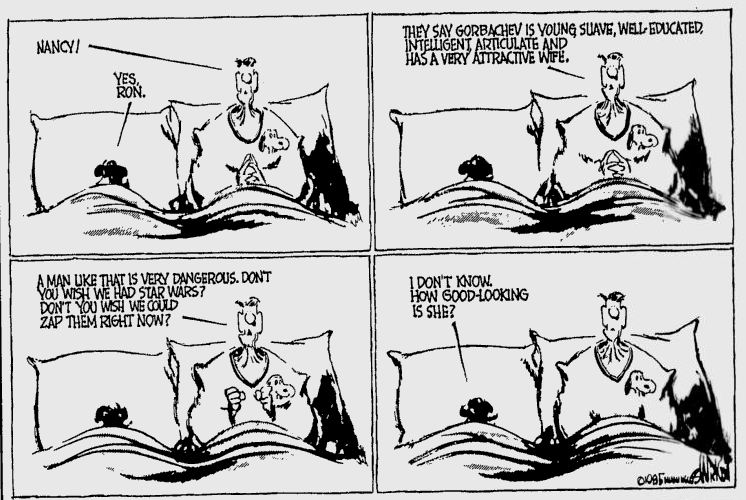 Thirty years later, some might argue that not much has changed. 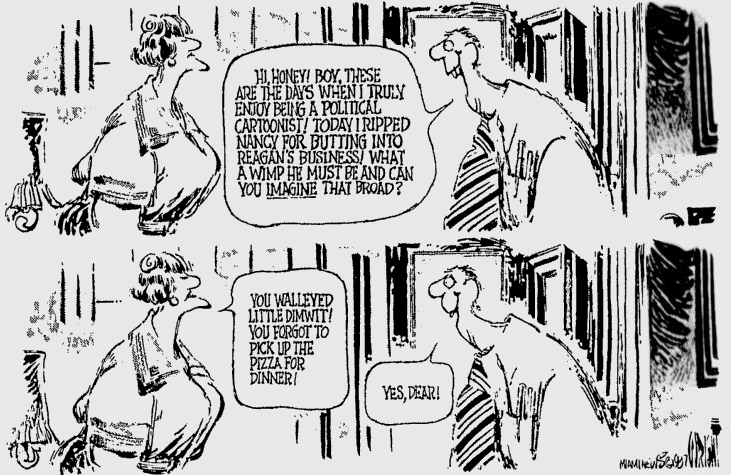 Miami News, March 9, 1985. Have you ever read a Facebook post that made you smile, but at the same time put a lump in your throat? That's what happened to me this morning when I logged on to Facebook and read a post by WLRN/Miami Herald reporter Nadege Green. Awesome news: Last year I posted about a teenager who lives near me and was a prolific hanger outer -- he skipped school, hung out by the 7-11. My husband reached out to him one day and invited him over for dinner. From there they formed a bond. I would eavesdrop on their conversations where the husband would share his personal story or hand him a book to read. He told the teen, "kings don't hang out on corners, kings aren't bums." Sometimes the husband would drop him off to night school to catch up on the days he would skip. In recent months I noticed a change. He stopped hanging out with the boys on the streets. He joined the 5000 role models and proudly wore the signature red tie. A few weeks ago I ran into him and he said, "Miss, I'm doing real good in school now. Really good." I smiled and told him to keep it up. Yesterday, he dropped by the house to show the husband just how good he was doing. He had a paper in his hand, it was a certificate: The Principal's Honor Roll. He earned straight As in all his classes. My husband tends to notice all the young boys on our block who at first glance might appear to be misguided. He always speaks to them. When we moved into our house a few years ago, there was a 13-year old who lived next door. The 13-year old was also friends with the teen who got the honor roll . My husband noticed he looked sad and like he needed some positive energy in his life. He didn't get around to reaching out to the 13-year old for some time because life happens and he was busy. Then, one day another neighbor came up to us to deliver bad news. The 13-year old was shot and killed in Little Haiti. It broke my husband's heart. He felt that maybe if he had gotten around to talking to this 13-year old, maybe he wouldn't have been in Little Haiti that day. Maybe he would still be alive. Shortly after the 13-year old died my husband vowed not to let being busy get in the way of making time for someone else. So when he saw the teen at 7-11, he said I'm not going to wait, I'm getting him now. Many of Green's friends responded with messages like this: "Thank you for sharing this, it brought tears to my eyes! Very inspirational - now let's go see which one of my students I can inspire today!" Others asked if they could contribute money to help the young man buy the frame or some school supplies. I am overwhelmed by the number of you who have contacted me personally to contribute cash or school supplies or something for the young man in the post from earlier. Here's what you can do if you want: Write an encouraging note addressed to Igor (that's his name). Sign your name and your title if you want (journalist, student, police officer, photographer) Send it to me via Facebook messaging, on my wall or email nadegegreen@gmail.com I will compile your sweet words and present them to him this weekend when we give him his frame during dinner. You guys are the best! 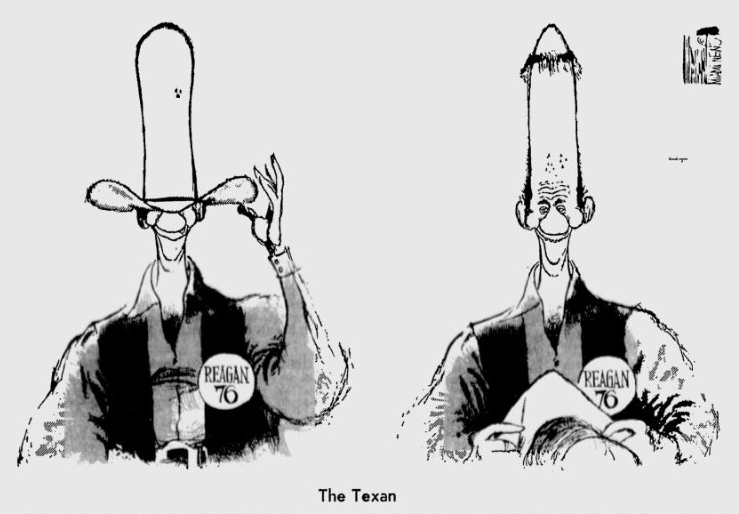 Following Ronald Reagan's landslide victory in the Texas Republican primary on May 1, 1976, Miami News cartoonist Don Wright turned in this classic sketch. Miami News, May 4, 1976. Kim Segal worked for CNN for 25 years ... long enough to remember a time when the network covered real news. I loved you from the moment we met. It was a time when you cared more about coups than poop cruises, when people like Baby Doc would get more air time than a kid named Bieber and when news was the star. Oh how I long for that wonderful time when news was the star. Segal was moving on to a new challenge. 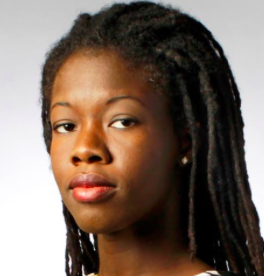 Somehow, despite the demands of a full time job in news, she managed to go to law school and earn a law degree...and then get a job with the Broward County Public Defender's office. Not long after reporting for work, Segal began writing about her new job and sharing her observations with friends on her Facebook page. Her posts offer an insider's glimpse at criminal justice as it's practiced at the Broward County Courthouse. LIFE AS A PD: After 5 months as a Public Defender I often find myself thinking, if I ever return to journalism I will never again read a police report as naively as I use to. After reading hundreds of police reports, or as we call them probable cause affidavits, you notice each crime has “buzz words” that are used by law enforcement to make sure the arrest sticks. For example a Drunk Driving arrest usually has a driver who smelled of an “alcoholic beverage”, had “red glassy eyes” and “slurred speech.” My favorite is when these alcohol-smelling people go to the facility for the breathalyzer and they blow a 0.0! Another example is Resisting Arrest Without Violence, which leads my list of stupid crimes. I shake my head every time I read that a client was charged with resisting arrest because he “tensed his arms” while being handcuffed. What does that even mean? In too many of my cases a car is stopped for a traffic infraction and the officer smells the “odor of marijuana” coming from the car. Smelling marijuana is grounds to search a vehicle. In one case, two officers claimed they smelled marijuana through their air conditioner vent that was coming from the car they were driving behind. Instead of reading a police report and immediately thinking I can’t believe what the arrestee did or what they allegedly said, one must remember these reports are intentionally written to make a person look guilty. If I was still in journalism I would read a police report with a much more critical eye and I would do a better job questioning not only what’s in the report but what was omitted. I know this must sound like I am bashing police officers. I am not. I appreciate the difficult and dangerous job they have. Many people I love and respect work in law enforcement and thanks to them our communities are safer. Yet, just like journalism there are those in the profession that don’t practice good ethics. We must never forget what makes our justice system one of the best in the world: We are presumed innocent until proven guilty! LIFE AS A PD: I could be talking to a client or reviewing a file but whenever I hear the Judge say, “I am remanding you into the custody of the Broward Sheriff’s Office” my ears perk up and I immediately stop what I am doing. I know the odds are high that within minutes that person will become my newest client. The last person I watched being handcuffed by the bailiff and put into the “box” (where the jury sits during a trial) was a 21 year-old girl who came to court with her mother. She was a “traffic criminal” she lost her driver’s license for not paying tickets yet she continued to drive. According to the Judge she had 3 open driving with a suspended license cases and she failed to appear in court 12 times in the past. The young lady with her hands cuffed behind her back and tears in her eyes waited as I negotiated with the prosecutor. I wanted to resolve all her cases in a way that would keep her out of jail. The prosecutor’s offer was 30 days in jail and I wanted probation. The state wouldn’t consider probation because the last time she was on probation she did not follow the rules. As the packed courtroom looked on I asked if the Judge would consider probation. It was an argument that I was doubtful I could win. “Yes your honor she violated probation in the past but she was just a child at the time; 18 years old,” I told the Judge. I then explained that this young lady was now going to a trade school and she recently started a job with a cellular company. Her mother, still in shock at the thought that her daughter could be spending the night in jail, came to the podium to help me convince the Judge. After a tense few minutes that felt like hours the Judge made his offer, 18 months of probation. That’s a very long time to be on probation and I have clients who wisely take jail over a sentence like that but this client was different, jail was not an option for her. So the cuffs came off and she was reunited with her mother. I know she learned her lesson I just hope she can successfully complete her sentence. LIFE AS A PD: As the elderly man made his way to the podium everyone in the courtroom just froze and looked at him. I know we were all thinking the same thing, what crime could this man have possibly committed? The man in dark glasses was carrying a long cane and a friend was leading him by the elbow to the front of the courtroom. Yes he was blind. Right away I grabbed the docket to see what he was charged with: Violation of Probation for DUI. After a brief conversation with the Judge we found out the man didn’t have an attorney and he couldn’t afford one. The Judge told him to fill out the application to have the public defender, me, appointed to his case. I sat with this gentleman and filled out the application for him. I had to ask about his debts, income and any property he may own. When it came time for him to sign the form I guided his hand to the area where there’s a signature line on the page. At this point I asked him when he lost his sight, I knew it was recent because his DUI was less than 2 years ago. He qualified for a public defender so the Judge appoints me to the case. Together we wait for probation to show up so I can discuss with them his violation which included not attending driving school, not doing community service hours and not reporting to probation. When the probation officer arrives in the courtroom I huddle with her and the prosecutor. Even though they are usually my adversaries I realize no words are needed so I just point to my client and ask, “How are we going to resolve this one?” We all knew we needed to make this case go away. After a brief conversation we agree that probation would be revoked in exchange for 1 day in the Broward County Jail with credit for the one day my client spent in jail when he was originally arrested on the DUI charge. LIFE AS A PD: When I opened the door to the holding cell I heard a young man say “Kim?” with a question mark in his voice. It took me a second but when I recognized him I had to fight back tears. I wasn’t there to see him, I had no idea he was in jail. I was visiting my clients and I had just returned one client to the holding area where the inmates wait for their attorneys. I immediately pulled, let’s call him John, out of the cell and sat him down for a chat. I have known John for about 13 years and I consider his family a part of mine. John’s a great kid who has grown up with more pain than any person should have to experience. I can only assume that it was drugs that dulled his pain and it was drugs that had him in shackles and cuffs during our random catch-up. As we sat at a table discussing his life and his family, I hear over the loud speaker his name announced. Next, I notice an attorney I didn’t know, walking to the inmate holding cell. I stop the attorney and ask, “Are you here for John?” He says, “Yes.” I tell this attorney I am also a Public Defender. I didn’t have to ask how I knew that John’s attorney would be a fellow PD. I quickly tried to explain why I am sitting with his client. I believe I said something like, “I’m a family friend and I just saw him in the holding cell so I pulled him out.” I have no idea what John said to his attorney after I left but a few hours later when his attorney sent an inner-office update about his client he added my name to the email. That’s the type of people I work with, people who care, people who listen and people who will go out of their way to include others. This chance encounter made me realize that every client is special to someone. What’s that saying, you shouldn’t judge others until you walk in their shoes? I know the shoes John was given and as bad as it was seeing him behind bars, he made me remember that I need to be the attorney for my clients that I want for John. He may have done things that were questionable but I love him and he deserves another chance and so do my clients. John is not just another inmate in the criminal justice system he is the person who has just changed me for the better.